The Head Office at CfSHE is the home site for Japanese exhibition, training and residency programs. 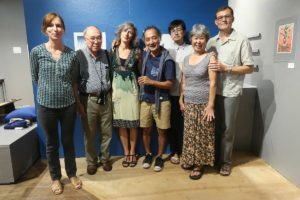 Pictured at IMCHawaii at Donkey Mill Art Center, the 2017 Board members include Jacqueline Gribbin, Yasuyuki Sato, Claire Cuccio, Hiroki and Setsuko Morinoue, Katsu Yuasa, and Ralph Kiggell. Not pictured: Tuula Moilanen and Michael Schneider.